For the latest news and trends on influencer marketing and social media influencers, subscribe to our industry digest newsletter! UPDATE November 2, 2017 — Instagram is growing incredibly quickly. Though it’s by no means new, users are signing up for Instagram in droves and are using features like Instagram Stories and Instagram Live with increasing frequency. As a result, the latest facts and figures on Instagram’s user base are always changing. In an effort to keep this article as current and accurate as possible, we’ve updated the information multiple times to reflect the newest statistics and numbers from Instagram. We’ve also preserved the original text of the article, though, and added updates above the appropriate passages with new and relevant information. Instagram’s enjoying a bonafide boom. After introducing a slew of new features in 2016 (Instagram Live, Instagram Stories, and an algorithm chief among them), Instagram saw impressive growth in its user base. Now threatening Snapchat with its competing feature set in Stories, Instagram shows no sign of slowing down. Over a third of all social media users are on Instagram, and as Instagram’s feature set continues to expand, Instagram’s user base will likely continue to grow, too. UPDATE: How Many People Use Instagram Stories? UPDATE November 2, 2017 — In Facebook's Q3 2017 earnings call, Mark Zuckerberg announced that Instagram Stories now has 300 million daily active users. This amounts to nearly double the size of Snapchat's current user base, indicating a clear shift in user preferences. UPDATE June 30, 2017 — Since its release in August 2016, Instagram Stories has seen dramatic growth. Less than a year after the feature was introduced, Stories sees 250 million active users every day. More creators are using the feature and users are engaging with the content in droves. The growth of Stories isn't slowing down, either. Quite the opposite — it added 50 million users in just two months, a month faster than its last 50 million daily active user jump. Growth is picking up for Instagram Stories, which is good news for the booming platform. With over 700 million Instagrammers using the platform each month, Stories is becoming a bigger and more central part of the experience. UPDATE November 2, 2017 — Instagram now has over 800 million monthly active users (MAUs), 500 million daily active users (DAUs), and 300 million daily Stories users. Its most recent 100 million MAUs were added in less than a month's time. 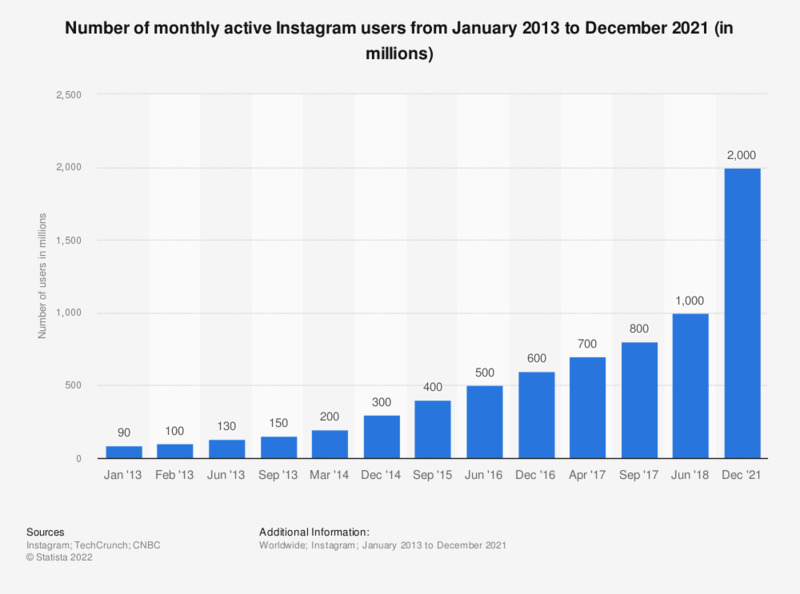 If Instagram's growth trajectory for MAUs holds, the platform may hit the 1 billion user mark before the end of 2017. UPDATE June 30, 2017 — Instagram now has over 700 million users, and 250 million users use Instagram Stories every day. In total, Instagram's added more than 200 million users to its platform in under a year, with 100 million of the newcomers signing on between December and the end of April. In December 2016, Instagram announced that it had reached a milestone, bringing in over 600 million monthly active users (MAUs), and during Facebook’s Q4 earnings call in February, Facebook CEO Mark Zuckerberg revealed that Instagram now sees over 400 million daily active users (DAUs) and that Instagram Stories alone reach 150 million DAUs. With over half a billion monthly active users uploading nearly 100 million photos and videos every day, Instagram’s crowded. There’s a lot of content to find, follow, and engage with. Which means, of course, that it’s difficult to find things. Related Post: Could Instagram Become A Victim Of Its Own Success? In a presentation at Facebook’s Machine Learning @ Scale event, Instagram Software Engineer Thomas Dimson said that Instagram’s research indicated that users missed about 70% of the content in their feeds under the chronological model. On the surface, this might seem like a necessary reality of the app. After all, Twitter functions the same way. More tweets cross users’ timelines than can ever possibly be seen. But that’s how Twitter’s designed to function. Central to its brand is being a snapshot of a moment in time, focused on what’s happening now. The same isn’t necessarily true for Instagram, where timeline content doesn’t feel as urgent and of-a-moment as it might on Twitter. In that way, the Instagram timeline lends itself to reorganization in the name of higher engagement. And so far, the grand experiment seems to be paying off. Instagram’s seeing incredible growth, adding around 100 million DAUs between June 2016 and Facebook’s Q4 earnings call in February 2017. With ephemeral Stories, Livestreaming, Gallery posts, and single photo posts, Instagram is becoming a home for a variety of content. Carving deeply into Snapchat’s growth (which is stagnating following the introduction of Instagram Stories), Instagram seems to be looking to win the visual sharing platform title. And why shouldn’t it? In an age where attention is more divided than ever between apps, feeds, timelines, articles, shows, and dozens of other types of content, a single app that exists to serve most of your photo and video sharing/streaming needs just makes sense. With a strong native advertising platform, an engaged and growing user base, an expanding array of content and offerings, and an increasing sense of ubiquity among internet users (28% of the U.S. population is on Instagram), Instagram is poised to keep moving forward and growing. If Instagram’s trend in DAU growth holds, it will see over half a billion daily active users by the end of the year. And sure, those aren’t Facebook numbers, but Instagram is keeping up a steady climb and proving more and more influential. Having added a new feature (allowing users to save Live Video to their phones after a stream ends) just yesterday, Instagram isn’t slowing down, and it’s a good bet that, at least for the time being, its growth won’t either.